If you work as a marketer in a global company, this conundrum is all too familiar. On the one hand, your content must be unified: Everywhere in the world, the messaging must be consistent, and people must recognize the brand. On the other hand, rigid consistency across cultures can backfire or undercut your business goals. When it comes to global content, one size does not fit all. Rebecca Lieb gets it. She works as a strategic advisor and research analyst on digital marketing for many of the world’s leading brands. 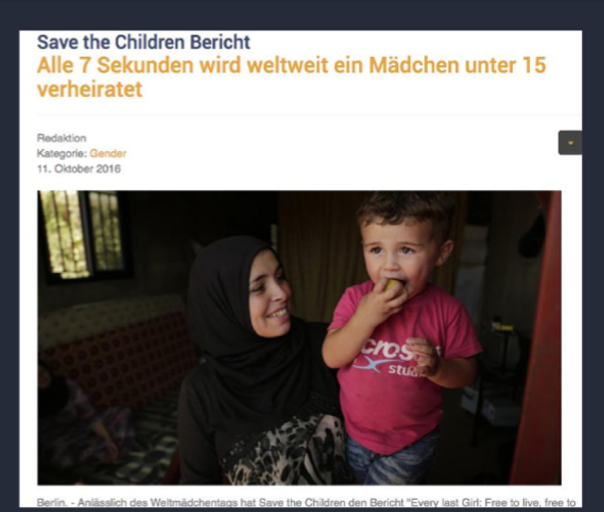 In her Content Marketing World talk, Global Content Marketing Strategy – Creating Content for Diverse Global Markets, she emphasized the need to approach global content from two directions at once: top-down and bottom-up. Marketing headquarters pumps content, messaging, and brand guidelines to local offices the way the heart pumps blood. The system works only when the heart uses what the extremities deliver back to inform new phases of content and new initiatives. How does your global enterprise create a healthy content circulatory system? To foster the kind of two-way communication required by a global content circulatory system, you need a content evangelist. The evangelist may not have a title comparable to chief content officer. That person might be head of digital, head of marketing, or head of social media. What matters is that someone plays an evangelizing role, which includes two parts: conveying the importance of the centrally developed content and processes to people at all local offices AND listening to local concerns. Here’s a cautionary tale. Rebecca worked with one global tech company that didn’t evangelize, didn’t socialize. Its communication was not a circulatory system. It went one way. There was no give and take. The content evangelist takes local requirements into account and considers the WIIFM (what’s in it for me?) factor. “One of the best ways to evangelize content is to show the other person, the other team, the other department why this is going to work for them. People want their jobs to be easier,” Rebecca says. Rebecca urges you to start creating a culture of content before you start hiring. When you’re interviewing someone for the marketing department, you need to ask whether the person is willing to create content and identify stories. You might want to look for a content identifier: someone who doesn’t necessarily create content but who can identify the kinds of content you need – someone with a nose for news. You’ve got to get people talking. It’s shoe leather. It’s journalism 101. To build a culture of content, you may need to get creative in making business cases for the resources you need. For example, Sony Europe found people were contacting its call center because they had trouble with a function on a TV. Every call cost Sony 7 Euros (about $8.65). When the head of community learned this, they created a couple of paragraphs of content about how to fix this issue, threw it up on the Sony website, and got 42,000 views in the first few days. Calculate each view as one less call and it translates to a return of 350,000 Euros (over $363,000) in the first week. “That’s a metric you can take to the C-suite and say, ‘Look, we saved 350,000 this week, and next week, and the week after.’” That kind of thing can convince executives to give you more money, without which it’s tough to build a culture of content. Global strategy requires a bit and possibly a lot of localization. Centrally created content may not work for the regions. You might have to adapt text and localize images, for example. “The local teams must have some authority and some self-determination to make content work on the local level,” Rebecca says. Here’s an example. 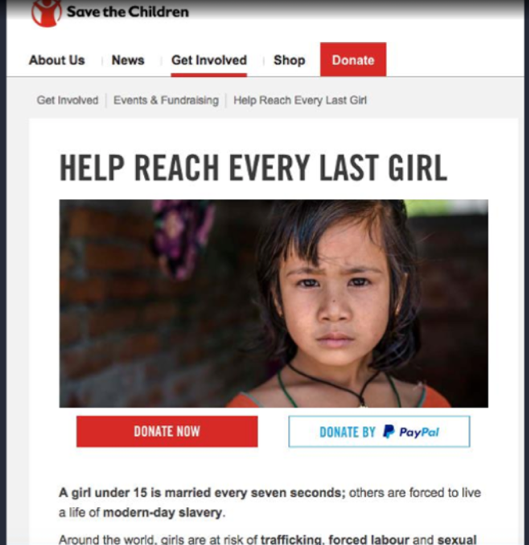 This a Save the Children landing page in the United States. 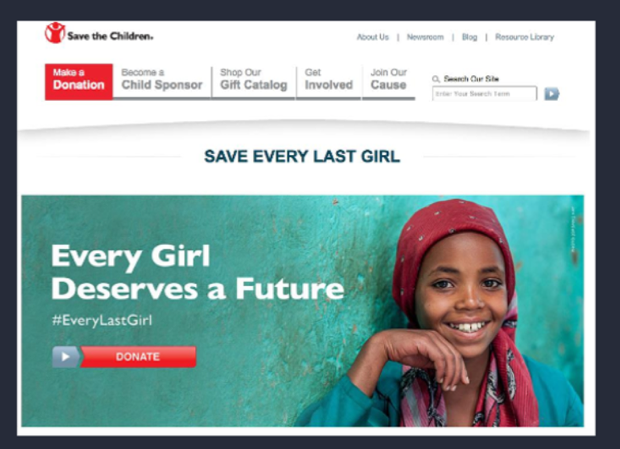 It includes assets around every girl, an #EveryLastGirl hashtag, a call to action on the red button (“donate”), and an option to download a research report. Here is how the United Kingdom team interpreted that content for its audience. While the main message is the same, the text and the image have been adapted for British readers. Here’s an example that tickles me. The Dunkin’ Donuts branding is unmistakable. Yet, if you look closely, you see that page shows a dried-pork-and-seaweed donut, a variation clearly intended for an Asian region. You might say that this ad hits that spot – that sweet spot, in this case – where global meets local. The adage, “Think global, act local,” sums up the balance that each enterprise strives for in creating consistent worldwide content that works in each region. 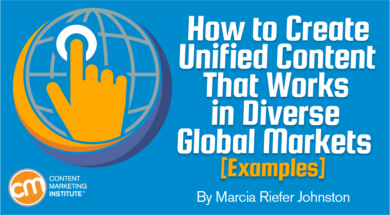 Does your company try to create one-size-fits-all global content? Or do you aim for a global-local balance? What do you do to keep branding, messaging, and processes consistent around the world while adapting to cultures and regions? What’s your dried-pork-and-seaweed donut? If you must think globally at your enterprise, make plans to learn in Cleveland, Ohio, Sept. 4-7 at Content Marketing World. Register today using code BLOG100 to save $100.